The Current Lincoln Town Car is not long for this world, and its styling wasn't all that elegant to begin with. Today's Nice Price or Crack Pipe '89 however is sharp enough that you could cut a line with it. You probably wouldn't want to be reliant on yesterday's Rialto to get you anywhere in one piece, as its size and inherent tippiness proved that it would NOT be how 68% of you would roll. `With its hidden third wheel and blue plastic body, that Reliant could easily be mistaken for a tipped-over recycling bin if parked in front of your house on trash day. That might make it attractive to kooky British women who like to throw out cats, but it doesn't do much to advance your neighborhood cred. 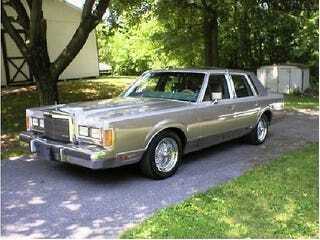 For that, you need something with presence, and you don't get much more present than a Town Car from the past. This Town Car, sporting 150-spoke wires and the taxi drivers' best friend seat covers hails from 1989, the last year of the truly baroque big Lincoln. And large marge it is, with a 117-inch wheelbase and 219 inchworms overall, it's notoriously b.i.g. And being panther platformed, it also sports a ladder frame that is shared with everything from the Family Truckster to the Police Interceptor that's parked out in front of Dunk N Donuts every morning. That all –in-the-Ford-family parts sharing extends to the engine, where, under the U.S.S. Enterprise-like hood of this Town Car beats the heart of a Mustang. Sure, at 150 horsepower, it might be a swayback old nag, but that doesn't mean that all manner of go-faster parts intended for the Blue Oval's 302 cid pony car engine won't bolt right on here in this big rig. You probably wouldn't want to go nuts though, after all the Town Car is not just an ocean liner in size, but in handling as well, so while a little more alacrity in acceleration wouldn't hurt, any real Autobahn-burner antics would probably end in steering wheel sawing carnage culminating in your final words being that's gonna' hurt. But that has never been the Town Car's intended purpose. It's designed, as implied by its name, to cruise urban environs, quietly and effortlessly transporting those of discriminating taste to the symphony, Broadway opening, or art gallery openings. That, or it's how a pimp rolls. The seller in this case knows exactly who his audience is, including both the World's oldest profession's supervisory staff, and also ballin and player in the ad's keyword spam. Now, it's unlikely that any of you are pimps, nor are you probably of the East Coast/West coast gangsta' ilk. However, it is possible that some of you rock the couture of a Scorsese flick, indicative of your affiliation with one of the local neighborhood benevolence societies, which is a group that would also find an '89 Townie appealing. If that's the case, meaning even your pajamas happen to incorporate a dickie, then this car is probably giving you a chubb right now. Inside, there're acres of space in which to chubb out, and while the car is old school, you're not relegated to that for your music as it sports one of those new-fangled fold-out DVD head units. As it does come from an era before such things were commonplace, the Town Car lacks any place to keep your 40, save for between your legs, and that may make it pretty crowded down there should you also like to rock out with your glock out. Perhaps that's the reason the leather on the driver's seat is the only place showing any substantial wear. The back seat looks like it's brand new, however, and is large enough that, should you have associates, a trio of them can ride there while leaving plenty of room for a box of cannolis. Similarly roomy, the trunk can hold an entire horse's head. This Town Car is presently located in Philly, a city that's notable for its crappy roads, making Lincoln's hemorrhoid-friendly ride advantageous. What you might consider disadvantageous is its $3,950 price tag. That'll get you 113,000 miles on the clock, and appreciative nods from all the legitimate businessmen in your neighborhood. What do you think, is this bling barge worth that kind of bankroll? Or, is that an offer you can refuse? Cheese Steak's Paradise or go here if the ad disappears.